History was made on St Helena at 13.50hrs GMT today, Tuesday 15 September 2015, as a Beechcraft King Air 200 aircraft (three photos attached) arrived from Angola and touched down at St Helena’s new Airport, prior to conducting a series of calibration flights. “It feels fantastic and we’re privileged to have flown the first plane to land on St Helena and to be part of your wonderful project. “I honestly can’t describe today. Years of planning and thousands of man hours have gone into this moment and to actually see it happen is an immense feeling. “Today we witnessed an event that will feature prominently in the history of this Island. For the Airport project another important piece of the jigsaw has slotted firmly into place. There are a few more vital pieces to be added before the picture is complete, but we are nearly there and I warmly congratulate everyone who has played a part in this extraordinary project. 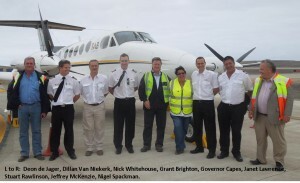 The aircraft crew comprised Captain Grant Brighton, Co-pilot and First Officer Dillan Van Niekerk, Chief Aircraft Engineer Jeffrey McKenzie – all of TAB Charters, SA – together with FCSL Chief Pilot, Stuart Rawlinson, and Chief Flight Inspector Nick Whitehouse, also of FCSL. The calibration tests will now commence. Several flights each day – weather permitting – will be undertaken.